What Are the Benefits of Wheatgrass for Cholesterol and High Blood Pressure? 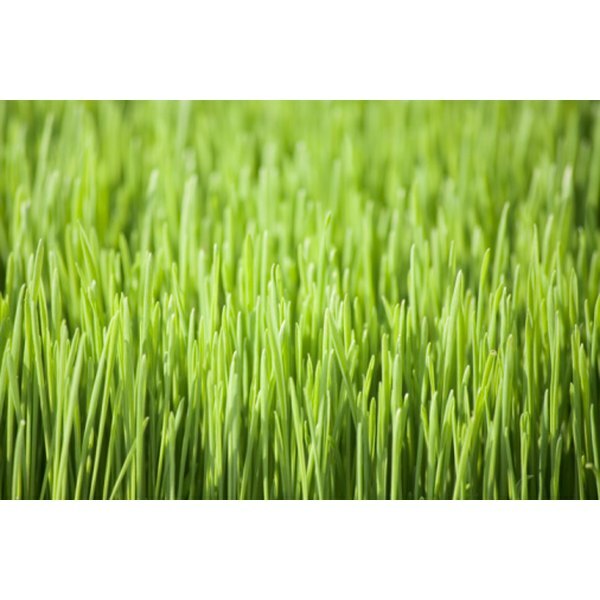 Wheatgrass refers to an immature grass that is a member of the wheat family. Its scientific name is Triticum aestivum. There are numerous claims for its ability to cleanse your body of toxins, generally improve your health and cure many diseases. Well-designed studies about wheatgrass with sufficiently large numbers of subjects are lacking. Ann Wigmore, who immigrated to the United States from Lithuania after World War I, helped establish the raw foods movement. She was an early proponent of the nutritional benefits of wheatgrass and other foods such as nuts, sprouted grains and carrots, but she was not a physician or scientist. Her claims about the health effects of wheatgrass won many followers, despite the lack of reliable studies to support her claims. You can take wheatgrass in the form of juice, tablets or capsules. Wheatgrass is known to contain high concentrations of vitamin A, C, K, B complex and E, as well as calcium, magnesium, iron, chlorophyll and amino acids; however, sufficient proof is lacking for its purported efficacy against health problems like infections, anemia, diabetes, constipation, skin conditions, tooth decay, ulcerative colitis, AIDS and cancer. In addition, data does not exist to support claims that the chlorophyll in wheat grass can boost oxygenation in your body. The preparation of fresh wheatgrass for consumption consists of growing wheat seeds in water for about a week and then juicing the leaves. Because they are fibrous, they are difficult to digest otherwise, and because the wheat grass may be contaminated with harmful bacteria, you run a risk of infection if you drink raw wheatgrass juice. If you are sprouting your own wheatgrass, make sure you keep the growing conditions as clean as possible. Wheatgrass juice has a grassy taste that you may find objectionable in which case you might choose to take tablets or capsules. Some individuals experience nausea from taking wheatgrass. In addition, dose ranges for wheatgrass have yet to be established. Still, it is generally considered to be safe, and there appears to be no danger in commonly taken amounts. Drinking about 10 oz. of wheatgrass juice at a time should be fine, for example. Memorial Sloan-Kettering Cancer Center: "Wheat grass"
Can You Build Muscle With Wheatgrass?